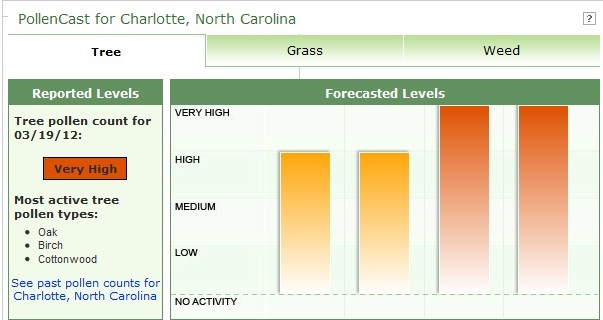 If you live in Charlotte, whether a native or not, you know that pollen is a huge problem. With the slight winter we had this year, your allergy symptoms have probably already geared up with a vengeance! The biggest culprit right now, according to Weather.com, are tree pollen in oak, birch and cottonwood trees, and the counts are very high. But it won’t be long before we add in flower and grass allergens as well – so we need to get ready for an active season! In addition to pollen allergies, mold allergies are big problem in our area as well. Mold allergies cause a lot of the same symptoms as pollen allergies, but some of these, like reduced lung capacity and difficulty breathing can be quite dangerous – so we need to address these as well. In this Charlotte HVAC Guide article, we will provide a few helpful steps that you can take to help minimize symptoms from seasonal pollen and molds that can invade your home. HVAC System: Your heating and air conditioning system could be the biggest culprit in mold allergies if you don’t keep on top of it by preventing toxic black mold from growing. Mold grows from moisture, and your HVAC needs to be properly maintained to prevent it. A few of the items you should take care of are sealing your duct work, cleaning drain pans and cleaning the indoor coil at least once a year. If you feel comfortable around HVAC equipment you may be able to take care of these yourself, but for the most part, you will probably want to have a Charlotte HVAC contractor provide these services. Seal it up: Pollen and dust are invisible and can get into your home anywhere and in the smallest of cracks and crevices. You should make sure that you keep your windows closed during allergy season and seal up any cracks or gaps around doors and windows. Humidifiers: Most high quality HVAC units now come with built in humidifiers, or they are an optional upgrade. Experts agree that this is the single best upgrade you can add to your system. Humidifiers work by maintaining the correct moisture level in your home. This makes your home more comfortable and help you breathe easier. In addition, by keeping moisture levels correct in your home, it will cut down on any areas that could grow toxic mold. Clean, clean, clean: Most of us know that you should keep your home dust free to help cut down on allergy irritants, but in order to keep the indoor air quality in your home the best it can be, you must be more aggressive during allergy season. Vacuum every day if possible, but at a minimum, twice a week. Bagged vacuums are much better than bag-less versions because they can pick up and contain allergens better. Dust furniture every couple of days and try to use one of the many electrostatic dusters on the market. These will keep the dust from becoming airborne and landing on other surfaces. Sweep wood surfaces daily if possible. Air Purifiers: Even if you have a humidifier on your HVAC unit, there will still be contaminants that could be lurking around your home like molds, viruses and bacteria. An air purifier combined with a humidifier can offer a duel-attack on poor air in your home. While it is impossible to remove every bit of dust, dirt, pollen and allergens from your home, taking the above steps can help minimize the effects of them on your health. By being proactive, you can breathe cleaner fresher air and help keep your home a healthier place to live. If you aren’t comfortable with performing any of the above items, you can simply call a Charlotte Air Conditioner Repair company and they can clean and maintain your system for you.